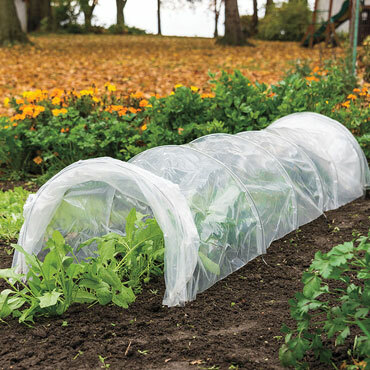 Protect your plants from frost and pets while allowing in plenty of sunshine by covering your crops with our Polythene Grow Tunnels. This solid plastic cover creates a warm, humid atmosphere for strong plant growth. An innovative end closure design allows for ventilation adjustment and easy access to the plants for watering, weeding, and harvesting. Install a drip irrigation line for even easier watering with our easy-to-use Drip Irrigation System for Gardens! Pre-assembled and easy to move, this sturdy tunnel is supported with galvanized steel hoops. Tunnels can be joined together to accommodate any garden. Each tunnel measures 10' x 18'' x 13".